Happy Halloween from Pendleton and Voodoo Doughnuts! Editor’s note: Today’s blog post is brought to you by guest blogger Mark Poltorak, who manages the Pendleton employee store. Enjoy it! Everyone who works at Pendleton’s corporate office has smelled it; that delicious odor of deep-fried donut batter as we leave the building and walk toward Burnside. A line of patient patrons congests the sidewalks for what seems like 24 hours a day. We see the iconic pink boxes all over town, in the airport and on TV. 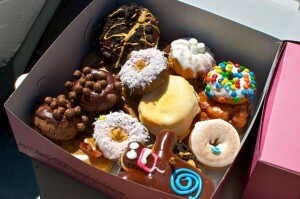 Established in 2003, Voodoo Doughnuts has become an iconic, must-see/eat in the “Keep Portland Weird” tourist scene. 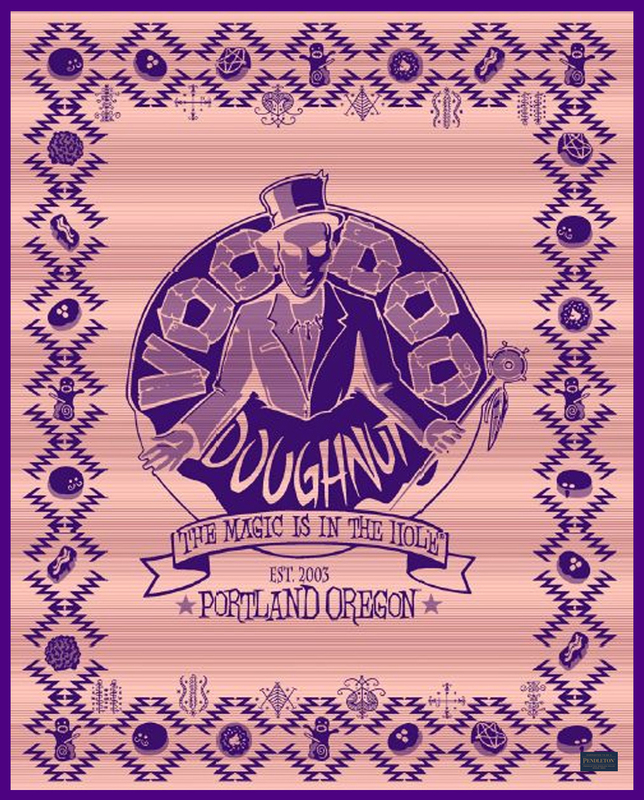 Now, Voodoo has asked Pendleton to create a Voodoo Doughnut blanket that will keep you as warm as those fresh out-of-the-fryer sugary treats. The blanket features a detailed display of Voodoo icons. In the center, emerging from the center of the blanket (and a doughnut, of course), we are greeted by none other than Baron Samedi. Baron Samedi waits at the crossroads between the worlds of the living and the deceased. He is armed with a shovel and eager to dig the graves and greet the souls of the newly departed. It is rumored that Baron Samedi can be brought to a swoon with treats (such as doughnuts!). A comforting sight to balance the grim aura of Baron is the impressive spread of Voodoo’s bread and butter: the doughnuts! Fans of Voodoo will find all their bizarre but delicious favorites: the McMinnville Cream, Neapolitan, Diablos Rex, Sprinkle, Bacon Maple Bar, Portland Cream and Triple Chocolate. Of course, the blanket wouldn’t be complete without a representation of the most iconic Voodoo doughnut of all! The Voodoo Doll doughnut is featured multiple times.